Often in a review of brakes, or an article talking about braking the author will use the term "modulate." E.g. "The brake modulates well" or "Modulate your front brake." What exactly does this term refer to? Brake modulation how much fine control you have to apply a range of braking power distributed over the pull of your brake levers. 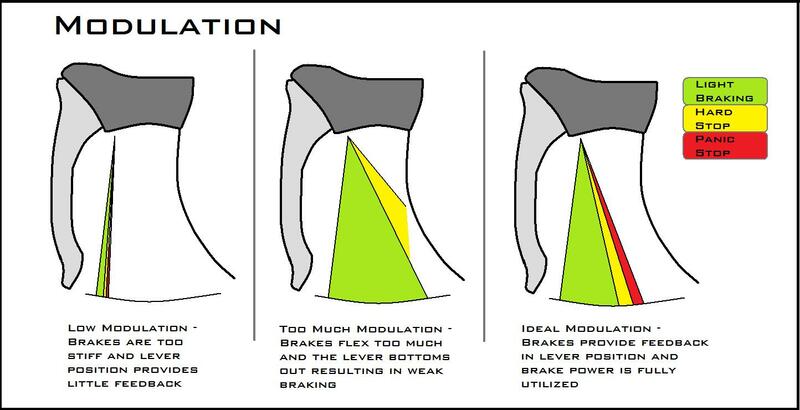 No modulation is basically no braking vs wheel locking. Having low modulation will mean it's hard to feather the brakes and you can only really lock up the pads. Too much modulation means you will bottom out on the levers before you lock up on the wheels. Ideal modulation gives you access to the whole range of braking power desired and allows you to apply it evenly across the range of the brake lever, giving you fine control over feathering the brakes, stopping firmly, or locking the wheel. Lightly feathering the brakes. Hard braking often locks up a tire causing a skid or to break free from the ground. This is uncontrolled and damages both tires and trails. So to modulate the brakes, slowly squeeze the brake lever, and pausing mid way once the brakes are working, you probably have more you could squeeze, just dont need to. Different brake set ups will offer differing levels of available modulation. How do I increase braking power and “touchiness” of Sram Guide RS Brakes?